OTJ Architects, a premier interior architecture firm located in Washington, DC, has added a sixth studio within its award-winning interior architecture design firm. OTJ Architects(OTJ) has experienced significant growth and success in the past two years, which has resulted in the addition of a new design studio. Overseeing Studio 6 is Travis Herret, AIA, who has been promoted to Studio Director. Herret, who has a Master of Architecture and Bachelor of Design from the University of Florida, has 14 years of industry experience and has been with OTJ for a total of eight years. He will oversee a staff of architects and designers focused on landlord and tenant broker services. Herret’s accomplishments include the recently awarded Honor Award (Gold status) at the IIDA Mid-Atlantic Chapter Design Awards for the design of the American Gaming Association (AGA) office located in the District. AGA was submitted in the “Under 10,000 Square Feet” category, and the Honor Award signifies the best project in the category. Contact OTJ Architects to discuss your architectural needs today. OTJ Architects is a well-respected national interior architecture design firm that has successfully completed thousands of projects throughout the country. 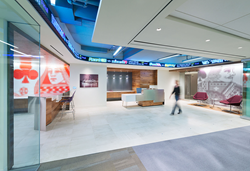 Founded in 1990, OTJ is comprised of five studios headquartered in Washington, DC, with more than 60 architects and designers, many of whom are LEED Accredited Professionals. We are workplace designers who focus on you – your goals and your opportunities – to create a unique vision of your future work environment. Our goal is to constantly challenge ourselves to design better, smarter workplaces that allow people to work strategically, flexibly and with a better quality of life. For more information, please visit http://www.otj.com.